These payment terminals all support the EMV standard. EMV (an acronym for Europay, MasterCard, and Visa), is a worldwide standard IC payment cards (AKA "chip cards") and IC card capable point of sale (POS) terminals for authenticating credit and debit card transactions. 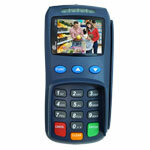 iSC350 EMV Card Reader, Signature Capture, 5.7'Â Screen, Color Display, Contactless capabilities, EMV Card Reader. PCI 2.X device, Video/Audio Capability. Power supply and cables sold separately. Requires key injection to accept payment processing. SP30, Dual Com-NFC & Contactless. D200, MPOS with Wi-Fi and Bluetooth included. iWL252, Mobile payment terminal, Bluetooth, TFT-LCD Color QVGA Screen. Requires key injection in order to accept debit or credit card payments. Please call for more information.